Lady Alice Rosé MCC was created due to the constant requests from the ladies in the Tasting Room. Will certain turn any occasion into something memorable and special. Lady Alice Rosé MCC was created due to the constant requests from the ladies in the Tasting Room. A hint of onion skin colour makes it look very enticing and inviting. It’s a wine for celebrations and commiserations, for drinking on its own or pairing with food (try oysters or Gentleman’s Relish on toast) and is certain to turn any occasion into something memorable and special. Grapes were handpicked at the end of January between 19 and 20°B and whole bunch pressed. Only free run juice was used and settled for one day at 8°C after which it was inoculated and fermented for approximately two weeks at 14 – 16°C. 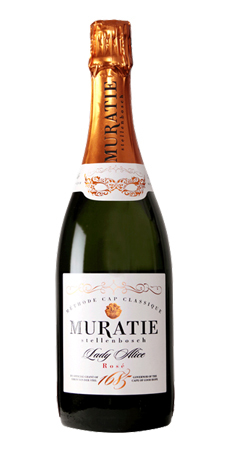 Tucked into the exquisite Knorhoek Valley north of Stellenbosch, Muratie Wine Estate, one of the oldest estates in South Africa, under the stewardship of Rijk Melck and his family, has been at the heart of a lot of passionate debate. This debate is centred largely around the desire to protect a century’s old wine experience that is a magnet for wine lovers around the world. Muratie's rich history is captured in every nook and cranny. Wherever you are on the estate you cannot help being moved by a sense of the many generations that have lived and worked there. The buildings, the artefacts and even the shrubs and trees exude an aura of the colourful past reaching towards an even more fruitful future. Standing in front of the cellar door at Muratie, you will see a small white building, this was the first home that Lourens Campher built for his family. Beside the house is the oak tree his wife, Ansela van de Caab, planted. The strength and beauty of the tree is a testament to the steadfast love Lourens had for his Ansela.